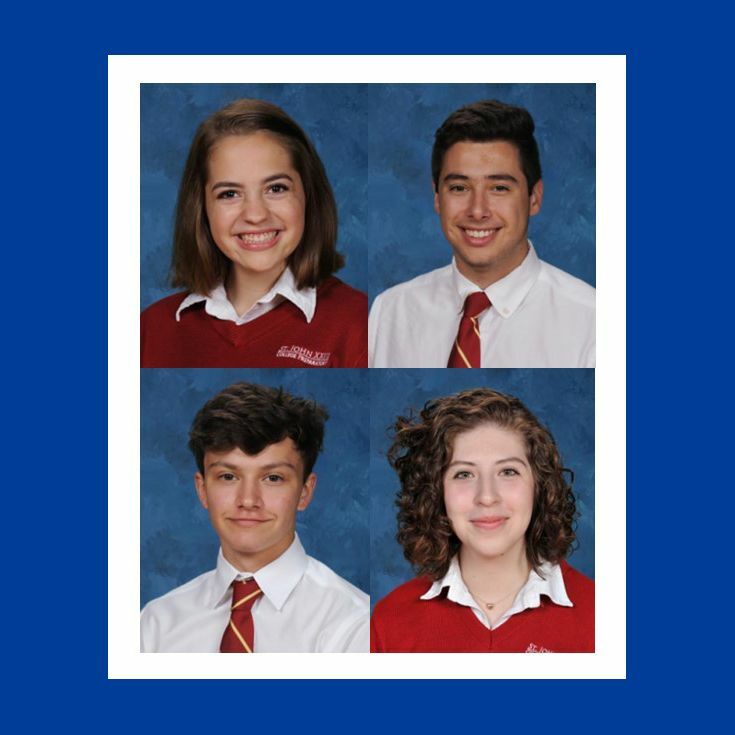 Four St. John XXIII College Preparatory students were recently named in the National Hispanic Recognition Program (NHRP). Principal, Mr. Tim Gallic, is pleased to announce the names of four students earning recognition through the National Hispanic Recognition Program (NHRP) based on their scores on the Preliminary SAT/National Merit Scholarship Qualifying Test (PSAT/NMSQT). These students are Caitlyn Cano, Eli Irvine, Zyanya Martinez, and Thomas Rider. The College Board’s NHRP honors approximately 5,000 of the highest-scoring Hispanic and Latino 11th-grade students who take the PSAT/NMSQT. Students who received this recognition scored in the top 2.5 percent among Hispanic and Latino test takers. These students are from the United States, Puerto Rico, the U.S. Virgin Islands, Guam, the Mariana Islands and the Marshall Islands, as well as U.S. citizens attending schools abroad. Matias said many colleges and universities will grant scholarship opportunities to NHRP designation students upon admission. For example, Texas State University awards $2,000 per year for four years, totaling $8,000; Texas A&M University offers $3,500 per year for four years, totaling $14,000; and the University of Alabama – Huntsville offers the Platinum Award of Academic Distinction. This 4-year award is valued at full tuition and includes stipends and allowances that cover meals and housing expenses. To qualify for the recognition, students must: take the PSAT/NMSQT in October of their junior year; be at least one quarter Hispanic or Latino descent and identify as Hispanic/Latino on their PSAT/NMSQT answer sheet; achieve the minimum required PSAT/NMSQT cutoff score as set yearly by the College Board; and achieve a cumulative GPA of 3.5 or higher by the middle of their 11th-grade year. The NHRP makes this information available to subscribing colleges and universities. Students are encouraged to indicate that they have been recognized as a NHRP Scholar on college scholarship, internship and job applications. Established in 2004, St. John XXIII College Preparatory is a premiere Catholic high school with the mission to prepare the hearts and minds of our students to serve God and others. Located on 35 acres, the campus is conveniently located off the Grand Parkway and I-10 near the communities of Houston and Katy, Texas. St. John XXIII offers honors, AP, fine arts, and numerous athletic and extracurricular opportunities. Students are grouped into five “houses” to promote school spirit, fellowship, spirituality, and academic achievement.